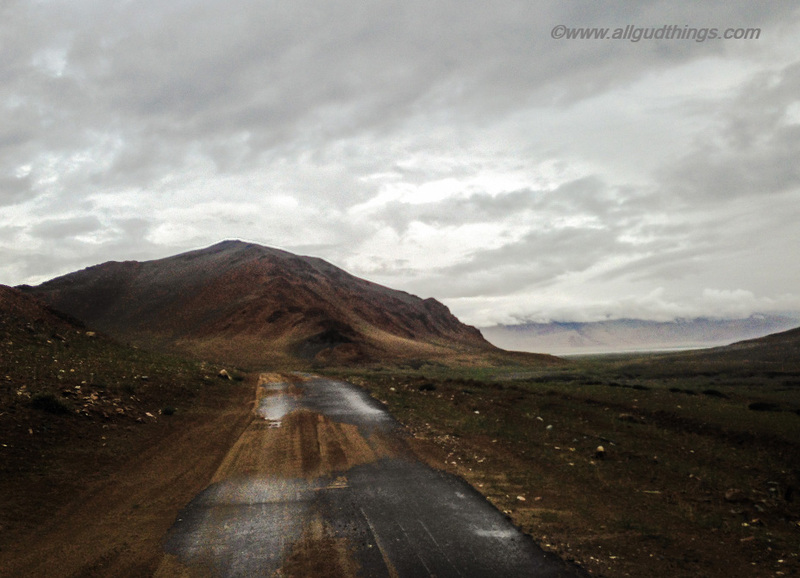 As we are writing our next series of Leh Ladakh road trip, we are getting nostalgic. 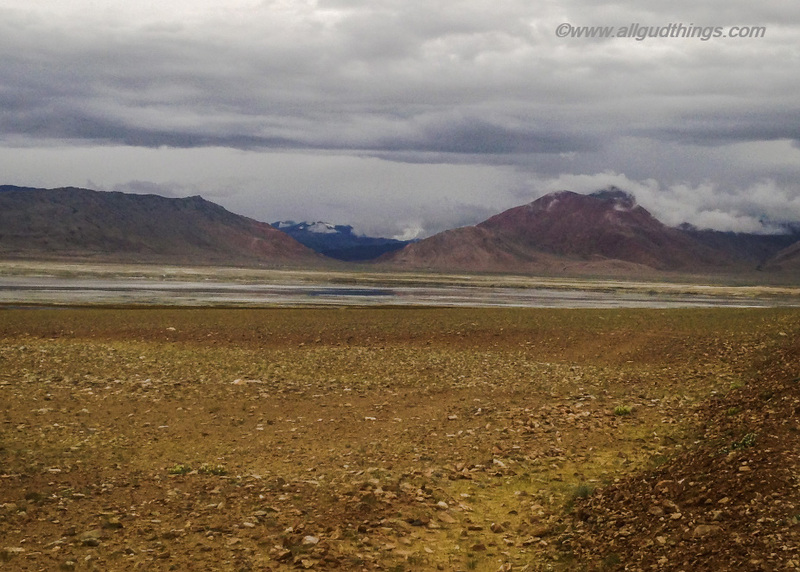 We started writing about the Nubra Valley but the story of White Lake Tso Kar, which is the smallest of all the three lakes (Pangong Tso, Tso Moriri, and Tso Kar) popped up before in our mind. We will surely come back with the post on the Nubra Valley next. Tso Kar can be reached directly from Tso Moriri, via going to Leh from Manali or via returning from Leh to Manali. From Tso Moriri: White Lake Tso Kar lays 90 km from Tso Moriri and the total distance can be covered in 4-5 hrs. The roads of this route are only of gravel and dirt. From Leh: Tso Kar lays 153 km from Leh. Ahead Debring, there is a diversion for Tso Kar. The whole distance can be covered in 5 hrs, crossing Taglang La. The roads are really good except few patches of gravel and dirt. The White Lake Tso Kar, also known as Kar Tso or Tsho Kar is an L shaped brackish water lake in Ladakh at an altitude of 15,367 feet. 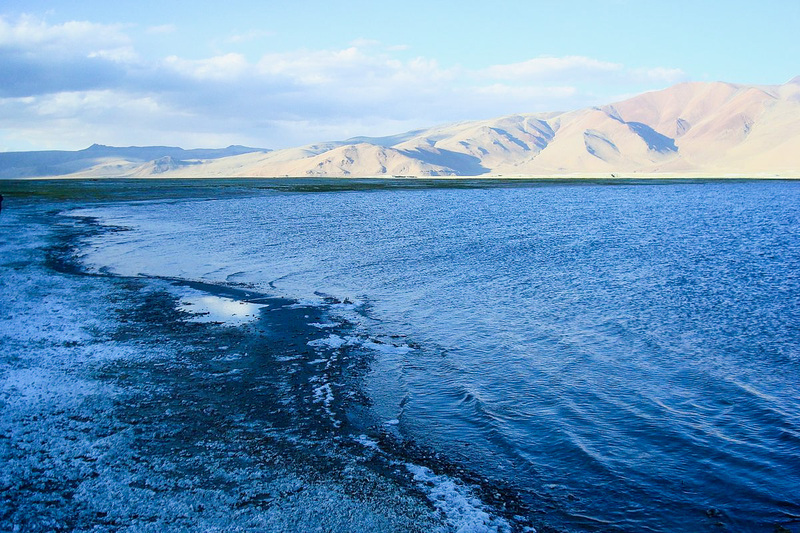 It is not a wide expanse of blue water like Tso Moriri and Pangong Tso but a marshland in the wide valley with deep water at places, spreading up to 7.5 Kilometre. The other end of Tso Kar can’t be traced standing anywhere, even from the Thukje monastery top. Around the White Lake Tso Kar, there is dense and tall grass and thick salt deposits. The salt deposits can be seen on all the sides of the lake, making it look white but the maximum was on the eastern side and these exactly resembled the days or month’s old snow from a distance. The salt was and is still collected by the local nomads known as Rupsu Chang and traded locally in Jammu and Kashmir. Tso Kar, the White Lake is not as blue and turquoise like other lakes of Leh but it is more of bluish white. It is surrounded by snow-capped peaks on the western bank whereas the colored reddish purple hue mountains on the southeastern side. The straight tarmac roads run in the village between the valley and look newly built and super clean. 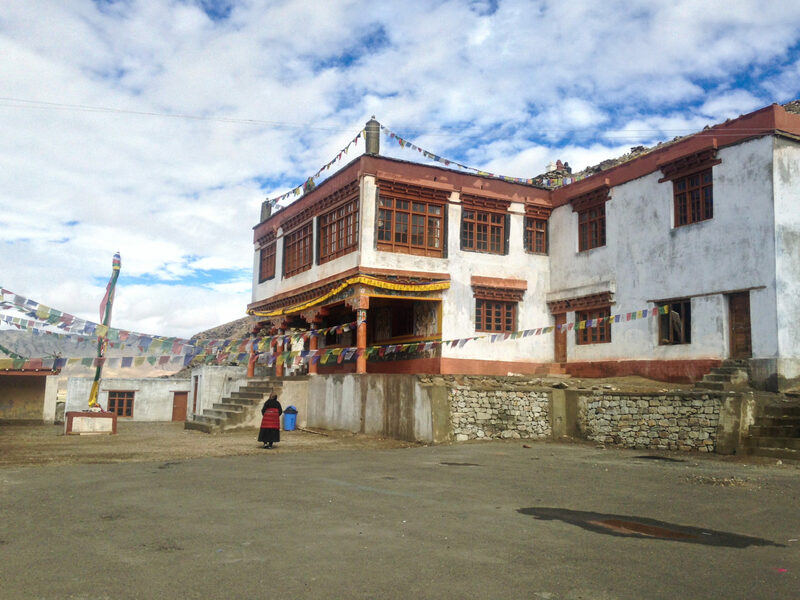 Historically, the White Lake Tso Kar ranged high up till the valley and the cutout marks by water can be clearly seen on these huge mountains, while ascending towards the beautiful Monastery of Thukje Village. But look at the lake now, it has receded drastically and is still receding every year. The surrounding countryside of Tso Kar is a bird watchers and wildlife paradise. Locals answer the place to be a home to the Kiangs, Tibetan gazelles, Tibetan wolves, and foxes. We only could trace the Beautiful Kiangs/ Kyangs, largest of wild asses sprinting and roaring around the white lake. The roaring sound was loud, distinct and it echoed in the empty valley, leaving us completely chaotic and fuddled. At the basin, one can find ducks, black-necked cranes, bar-headed geese and crested grebe. The Black-necked cranes come to Tso Kar to lay eggs. There are just single-digit counted white gray parachute tents, home stays, and resorts at Tukhje village. We choose to spend a night at Tso Kar resort which lies at the end of the village and away from the White Lake Tso Kar, completely engulfed in the calmness of the virgin landscapes. The Tso Kar Eco resort houses both tents as well as rooms. We choose the tent first, thinking the clouds will vanish by night and we will be able to see the galaxies above. But the temperature dipped further because of strong wind, rain, and snowflakes in the late evening and it forced us to move to the rooms. 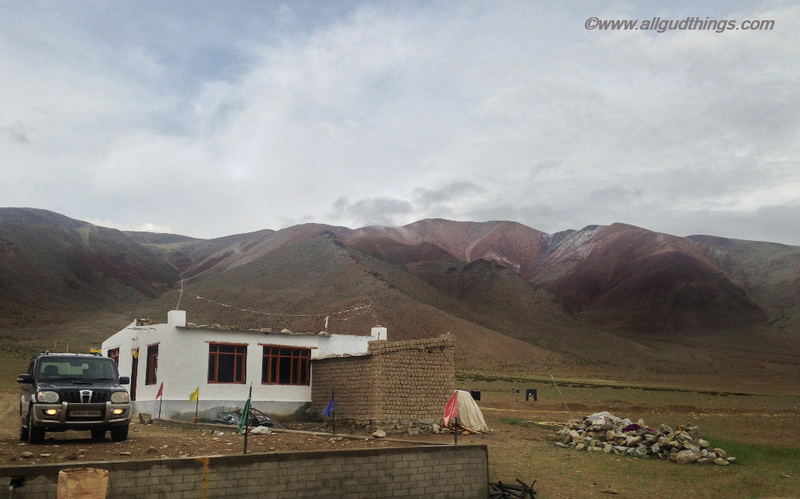 Rooms at the resort are very basic, equipped with enough of blankets and quilts to keep you warm, but still, AMS (Acute mountain sickness or Altitude sickness) surely hits one at Tso Kar. We too felt this was the coldest place and night in our whole Leh Ladakh trip. The staff of the hotel was quite courteous and friendly. They enlightened us about the locality but still, we were uncomfortable and uneasy because of the chill. Cook served us a three meal course for dinner with 90’s songs playing in the background but we were not able to take even two courses in that cold. Electricity comes in the village as well as the resort only after 7:00 pm or when it gets dark and stays till 11:00 pm. In the morning, there is no hot water in the washrooms but staff provides the same in buckets to get fresh. And forget about the phone and internet connections here. 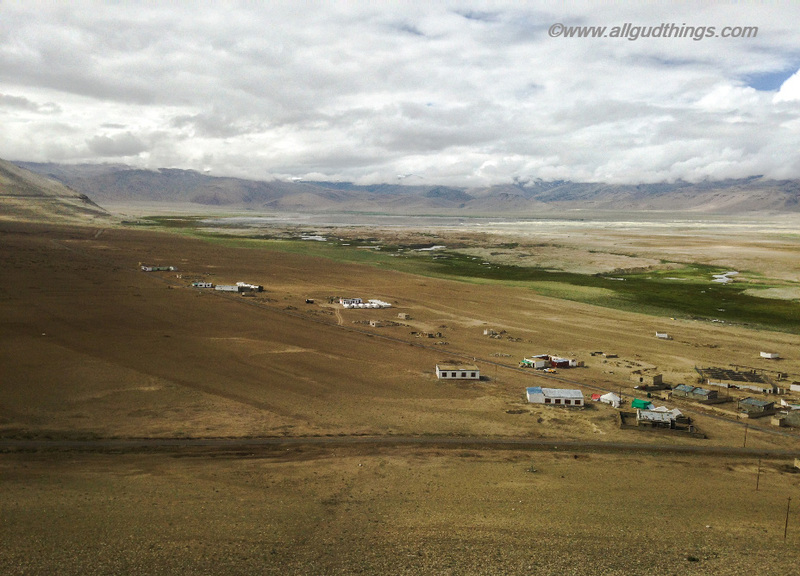 After getting fresh, we drove till Tukjhe monastery to get a glimpse of the Tso Kar lake from height and that is what we saw- not only the white and blue strip of the lake but the vast shaded landscapes extending up to several kilometers. The scenery around can make you stare it for hours. That was not the end; we came back to the Tso Kar Resort to take out luggage to leave ahead but our chit-chat with the staff members of Tso Kar resort still continued. We were really curious to know what they do in their free times. And the answer was full of leisure time. They listen to songs, chit chat, soak and sleep in sun. Interestingly one of them, Tenzin loved to write too. The writing he shared with us was simply amazing and we thought of sharing his thoughts with you with his permission. We read the poem multiple times standing there and felt his talk with nature is deep and lovely. The village Tukhje and white Lake Tso Kar are natural and straight out from heaven. There are the only bunch of villagers in the village and army base which is a kilometer away. Villagers might be talking and spending time with each other but they also love talking to nature. After all, nature is their best and forever friend in this deserted barren land. Even, if the days are warm at Tso Kar, evenings and nights can be chilly. So carry and wear woolens timely. And if it rains, on that, the temperature can even dip to 0 or -1 degree Celsius in summers. Rooms are basic in Tso Kar but they are good enough to keep you warm. There are high chances of being hit by AMS at 15,000 feet. So, take precautions to tackle it and stay warm. If AMS gets worse , do take help. Before heading towards the lake, check the trail carefully, as it is a marshland. The Lake is accessible only from June to October. Kiangs run and make you run endlessly if you try to come close to click them. 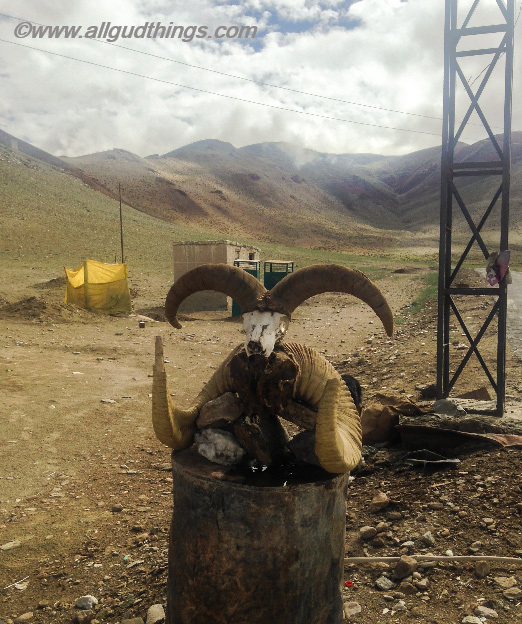 The horns of Urial (Wild Sheep) and Yak are kept as guardian, outside the homes in Ladakh. And don’t try to bring them at home with you, as the hotel staff informed us that it is illegal . Overall, we enjoyed staying and spending time at white Lake Tso Kar and the resort. We will surely like to go back when it’s sunny to get more views. What about you? This is the sort of travel I LOVE! Thanks for sharing. One day we’ll get up there, I see a tent with my name on it. 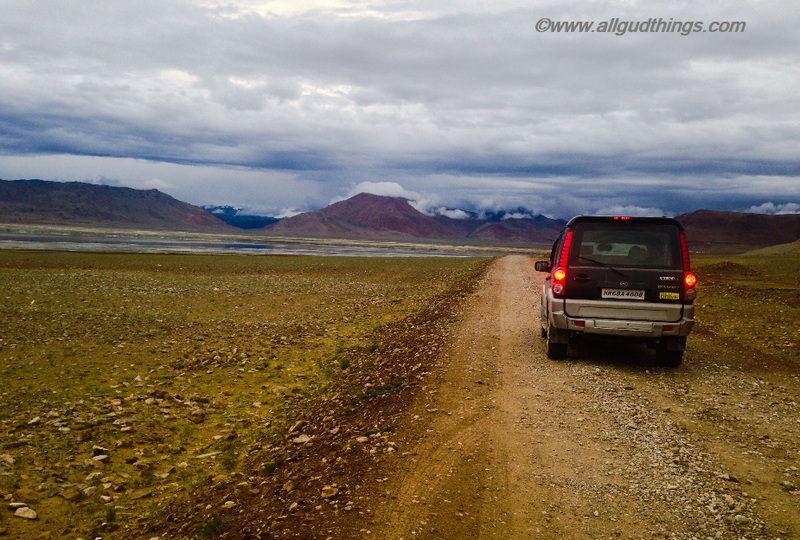 Such a pity that the road to White Lake Tso Kar is not that good, but still – you’ve managed, right! And the surroundings seems so rewarding. It looks so beautiful and serene by the lake, like there’s no one there. I can only imagine how that roaring sound must have echoed in the valley! 🙂 Must have been some experience! The tents at the resort don’t look all that glamorous, but then again the only type of camping I’ll do is glamping. It looks beautiful. Hope that made up for the road in. The tents look cool but I also would struggle to cope if it was super cold. Not sure how I would handle the AMS but it looks beautiful and very barren out there. Are there any legends and stories associated with this lake as they are in most mountain lakes? 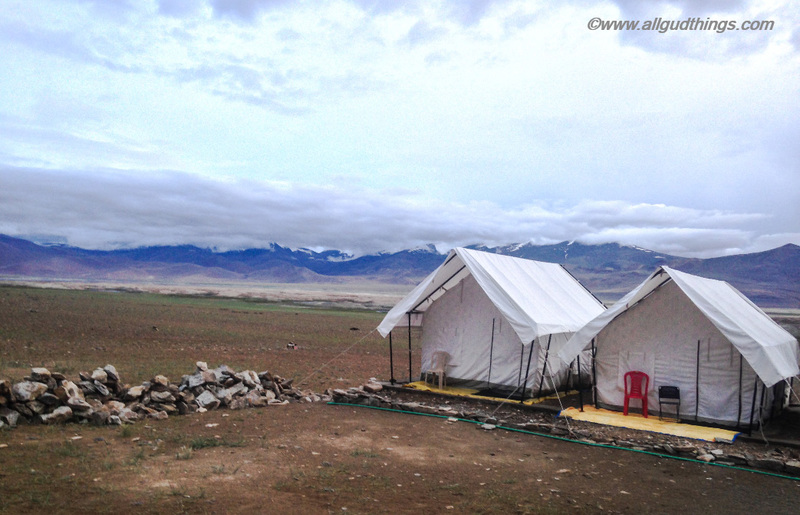 Anu, Neither the hotel staff nor the local driver told us any story related to Tso Kar lake. They just narrated that the lake is receding every year and years back it was high up till valley. It sounds like quite the chilly night in Tso Kar! But what a unique and interesting experience. And the mountains look absolutely stunning there. 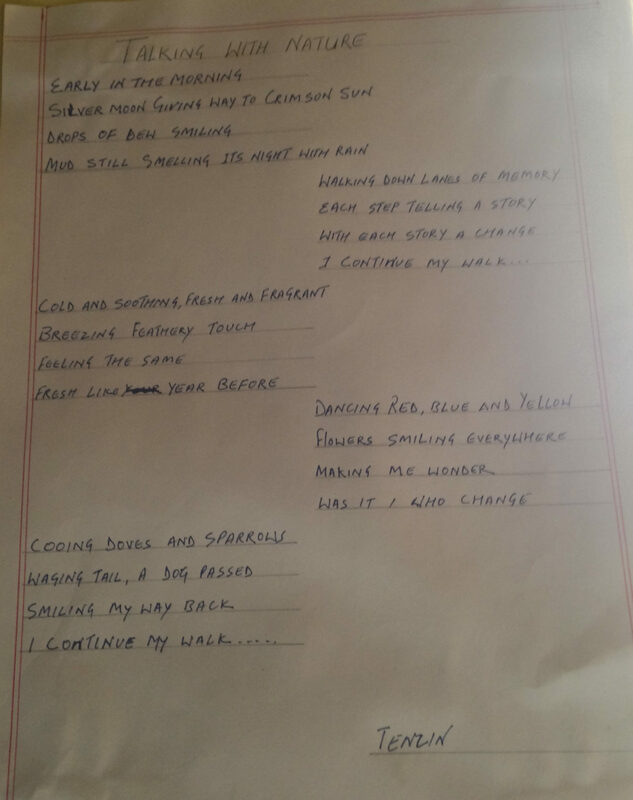 I loved that little poem by Tenzin and it’s so cute that he shared it with you – happy travels! I too have become nostalgic reading this! 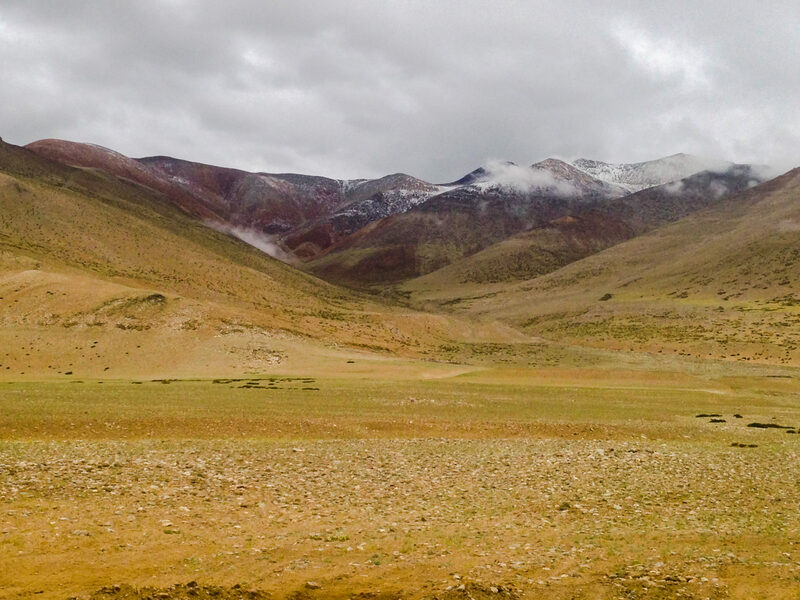 We passed by Tso Kar on our way to Tso Moriri and it was beautiful! Ahhh I wish to go back to Leh! This photography is absolutely gorgeous! It looks like such a beautiful and remote area, especially with your tip that you shouldn’t walk around at night because of the wild animals! I think when I think of India I think of bustling stressful cities, so it’s really nice to see the beautiful nature as well. Would love to visit here one day. Thanks Kate,for the lovely comment and bringing this to notice. Will Check this up. There are many salt lakes in Australia, but I didn’t know they existed at such a high altitude! The roads also sound similar to some of the more remote parts of Australia – but the scenery is completely different! It’d be so fascinating to visit this remote and wild region, but I think I would opt for the hotel room rather than the tent too! I loved Tenzin’s poem – it really captures the spirit of this amazing place. The white lake sounds really fascinating – I’ve been to a couple of different salt lakes before, and the large chunks of salt deposits are always an interesting thing to marvel at. I would love to visit to also explore the surrounding countryside of Tso Kar as my husband and I are avid bird watchers and wildlife fans. We haven’t seen any Tibetan gazelles, Tibetan wolves, or foxes in our travel yet so knowing they’re out there would be a big incentive to visit! Parachute tents look like really unique and authentic accommodation – thanks for this post! If the lake is receding, does that make it easier to harvest the salt? What an interesting post! Lake Tso Kar definetly looks like an amazing experience. Too bad that I have not been able to do Ladakh until now. Lovely photos! Hope to visit this gem soon! Ladakh is actually heaven on Earth. Unfortunately, it has been spoiled by too much commercialization. I had been to Tso Kar lake couple of times. First time when i went there, there wasn’t a single vehicle but now more people have started visiting it. However, it is far better than Pangong Tso. I was following this series of your Le Ladakh road trip and I’m happy to read another part of it! My favorite part, aside from the stunning view and the amazing lake, is your stay at the resort and the poem shared to you by Tenzin. I can feel how connected he is with nature and the place itself. This is such a beautiful journey, I’ll wait for the next one! The lake looks so beautiful and blue! Great photos and we love your sentimental touch of reading the poem. Looks like it was a great trip. The white lakes look amazing! We do photography and photo shoots and love unique locations. This was a great explanation on the trip! That’s a really cool road trip, I totally love these desolated landscapes. Sleeping in these tents lost in the mountains sounds like a fun experience to me. Thanks for sharing all these details, defnitely helpful for anyone planning to do this trip! What an adventure! Looks like it was a great trip full of unexpected turns. 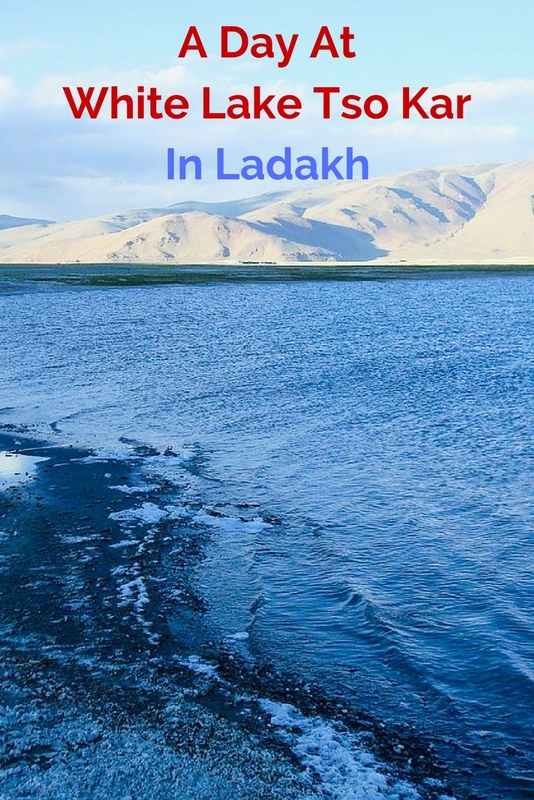 Ladakh looks like a great place to explore. Maybe I’ll make it there on my next trip to India! This looks like such a beautiful and remote spot! But yikes, those cold nights sound unpleasant. I can’t imagine staying in a tent in that weather…sounds like you made the right call by moving to the rooms. What a nice experience you guys had in White Lake Tso Kar! And Tenzin’s poem is so beautiful and truly describes the place with heart and souls! Love it! This is the kind of travel experience that I’m excited about! Ladakh is on my list. I have a friend in India who have been inviting me for the longest time. I hope I can visit soon! Ok! This looks like an incredible experience. I would love to see the Tibetan fauna! Wow! This is one for the bucket list! Thanks for sharing! I absolutely love the wastness of this region, it’s so beautiful! To sleep in one of those tents would be so cool! I wonder how cold it was? I once slept in a tent while it was snowing and this was pretty cold 😀 Thank you for showing us this great area of this world! Having just read your post I’m trying to pinpoint exactly the feeling it leaves me with, it’s so vast and sounds like the weather is in extremes. The tents look fun, but as you say, it would be not so much fun at all when the temps dropped and the snow started. Great photos and they really transport you there. Those are cool tents. Did you ever get to see the Milky Way even after you moved to the room? No, it was raining whole night. Wow! Everything is just beautiful and you can be one with nature. What makes me smile is that it well perserved. The tent looks like a cool accommodation. Although with weather changes ehhhh lol. Looks like serious stretch of God’s country. The white lake looks pretty cool too. What a great poem! Love it and the scenery in the area looks beautiful. I had never heard of these lakes before, but would love to check them out sometime. Thanks for the introduction to the region! Love how white and pure the mountains are! Even if travel time is quite long, I’m sure visiting White Lake is totally worth it. 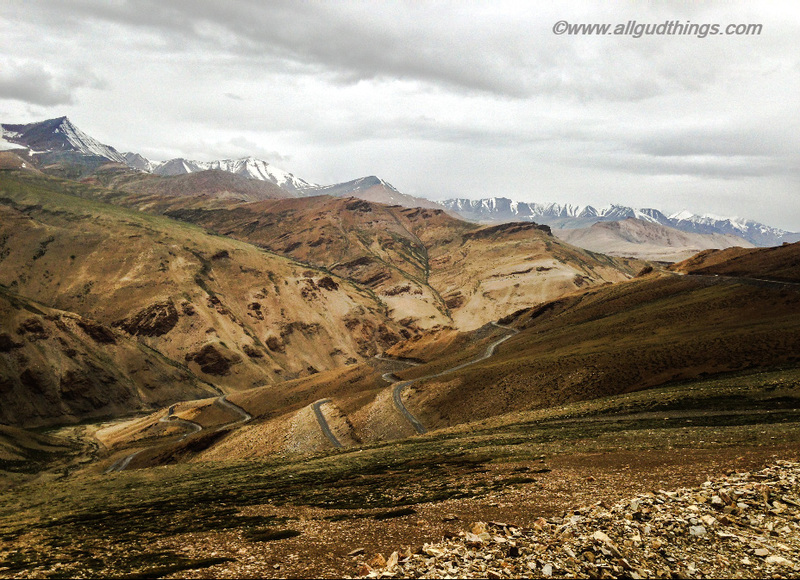 After completing Spiti Circuit, entire Ladakh region is high on my priority list. I must say, as expected, all images are stunning. I find Tso Kar better than Pangong as it is less crowded and less commercialized. Would certainly live in one of those swiss tents. What a beautiful remote spot. I hadn’t heard of White Lake before, thanks so much for sharing your adventure.